The Good, The Bad, The Elazul: Constitutional Referendum Fraud In Egypt? An Initial view. Constitutional Referendum Fraud In Egypt? An Initial view. Egyptians break voting records as they take their first hopeful step towards democracy, while fighting back against Fraud. Egyptians today voted for the constitutional amendments that have been widely rejected by all figures, political parties and organizations, except the army , the NDP and the Islamic movements (Such as the Muslim Brotherhood) as I mentioned in my previous post. There have been heartening reports such as a record number of voters, high female turnout in some locations , an entire middle class neighborhood reported to have widely voted no , Downtown voters countering Islamist mobilization campaigns, and even Egyptians finally standing in line in a civilized manner, up to the point that the Governor of Cairo AbdelAzim Wazeer was kicked out of a polling station for refusing to wait his turn in contrast to Prime Minister Essam Sherif who insisted on waiting his turn like all other Egyptians. It really is a new and better Egypt. Yet there have already been reports from all over about the various attempts at fraud that occurred today in Egypt's referendum, as well as various acts of thuggery, even though some analysts claim these acts shouldn't have a noticeable effect on the results. Referendum laws were loosely enforced or not at all. Islamic movements including the Muslim Brotherhood were able to continue using their religious propaganda to campaign outside and inside polling stations , The NDP was still buying votes, and the MB were giving out food to buy votes. The Muslim brotherhood & Salafists going so far as tearing down posters that call for a No vote and replacing them with their posters calling for a Yes vote in the coastal city of Marsa Matrouh. 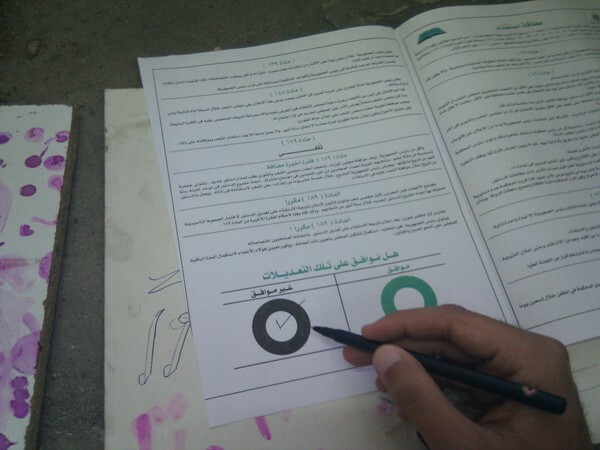 The religious propaganda was so strong that people in upper Egypt fear the referendum could lead to sectarian violence after earlier reports by an NGO (Egyptian Organisation for Human Rights) that the polling station was becoming a place of psychological warfare between Islamists and Copts. Why was the army decree to ban campaigning and media coverage on referendum day and the two days preceding it not enforced? The scenario I discussed in my previous post still stands out in my mind. Initially there was an outcry that the unstamped ballots were invalid and an attempt to steal votes, until later on in the day the situation was clarified: the Ballots are valid as long as a Judge signs them regardless of if they're stamped or not. they voted at the end but some Egyptians here were not happy #Egypt #dostor2011 Link to Tweet "
Presidential candidate and former head of the IAEA Mohamed ElBaradei was attacked by thugs while going to vote, the absence of security forces being quite suspicious, He tweeted about it saying "Went 2 vote w family attacked by organized thugs. Car smashed w rocks. Holding referendum in absence of law & order is an irresponsible act"
Voting in Upper Egypt was so disrupted due to lack of judicial supervision that the Army had to send Judges over by military aircraft, not a good move towards a region of Egypt that generally felt ignored by the Mubarak Regime. Human rights lawyer Ragia Omran (Who was accredited to monitor the polling) and her Sister Dana were arrested by the military today while monitoring a voting station, even though the authorities said that civilian monitoring is allowed and encouraged. They're reportedly being interrogated now, along with American photographer/journalist Dana Smillie . Reports of lots of some people being ignorant of what they were voting for, or even manipulated into thinking it was to decrease prices. Some people even downright refusing to vote because they weren't being paid to vote. Reports of violence in some places such as Bani Souief. Reports of the Election ink used to make sure people don't vote multiple times being fake and easily washed and so many other reports that have emerged that you can read here (Arabic) and here (English) and here (English) (although the links have slightly different information) among other places. Lastly, a Video has emerged claiming to be proof of Fraud in today's referendum, and instantly cries went out that the video was from an older referendum and thus fake. Now I want you to compare the ballots in all of the above with the first picture posted first and Judge for yourself, Did the first video show fraud or not? The ballot in the picture is the same as the one in the first video, but not in the others. Is it fraud? I don't know, but I'm sure eventually more footage will show up. And while I cannot verify the information, the non-profit website called Thawrastats.org initially posted pre-referendum poll and said that expected results would be very close with Egyptians being divided 53.5% Yes and 46.5% No . You can read their report in English and in Arabic ( The Arabic one has more details, including polling methodology, and information that the Delta was leaning towards Yes with 73% and 3 other locations in Egypt leaning towards No with 53-56% , you can see their breakdown map here ) They later explained why they're polls should not be considered "fact" in their post "What can go Wrong"
Now I wouldn't have even considered their polls if not for the fact that several other organizations projected similar numbers, including the government's own Information and Decision support center website that carried it's own poll that was for some reason taken down a few days ago, although the last recorded results for the poll stand at 57 percent against the amendments, 37 For the amendments, and 5 percent undecided. However, all current projections portray the "Yes" vote as being the overwhelming majority. With all of the above, and considering my last post, I have to wonder. Will people be outraged? Will they call for a re-vote? Will anyone really care? Frankly I don't know. Is it all bleak? Not really, we're somewhat wiser now to these attempts, things have changed, and we can consider this as a testing ground for future voting. We can be more vigilant next time. The fact that majority of people actually stood in long lines , behaved, and hell, the fact that they broke voter records is a victory enough as is. Regardless of the results, Egypt HAS changed. Sign claims people/groups that the only people saying No are the USA, Naguib Sawiris (Christian Businessman), Elbaradei, and Amr Moussa. Sign is indirectly inciting sectarian tension. But with the Damage already done, I just hope it isn't too late. Update : TravellerW reports: "Confirmed: Ragia and Dana Omran are on the way home. Alhamdulillah. Very relieved. Welcome home @rago_legal!! " At this point, we all have to just wait and see. The insane numbers of people who showed up and voted is just overwhelming and fraud wouldn't be as easy this time. Now we know where we missed, so next time instead of spending my effort with my neighbors i will spend more time with our new guard, our delivery men and all the simple people who didn't have the chances i had. Those simple people didn't mean evil they were just mislead by the evil ones. i hope we all do that, go to our villages and poor neighborhoods and hear the people's point of view and help them.